“Ooww!” moaned Vilas in a rather high pitched voice. He did find himself in a bed with a pretty serving girl just as he had planned for tonight. Yet the circumstances were somewhat different. He laid on his stomach, the girl was applying bandages to the nether parts of his back and to complete the humiliation, his companion Osborn the Ranger sat on a chair across from the bed and grinned like a devil. Athough Kleftis, the God of Thieves, has no real clergy or organized cult he is said to recognize giving of stolen silver to the beggars, drunken shouting of his name and certain obscure rituals passed on from master thiefs to their apprentices. One of these is the creation of a dog charm. It is said that to create a dog charm you have to carve a small wooden figurine of a dog using a stolen knife and then tie its mouth with a strand from a hanged thief’s rope. Furthermore, you can only work on the figurine during the night and you must finish it under a full moon. Also, you must not speak a word while working on the dog charm and when done, you should bury the knife on a crossroads. As it usually is with these rituals, nobody knows which of the steps are the important ones and which were simply picked up along the way. A dog charm is useful to the thief in two ways. Firstly, it renders all mundane dogs disinterested in the person of the thief. Secondly, it helps the thief blend in whenever he tries to blend in, sneak about and generally be stealthy. Rules: Every dog charm has 1d6 charges. Whenever a thief carrying the charm rolls for Stealth, the charm automatically adds a one point bonus to his skill consuming one of the charges. When the charm has no charges left, it loses all its abilities. 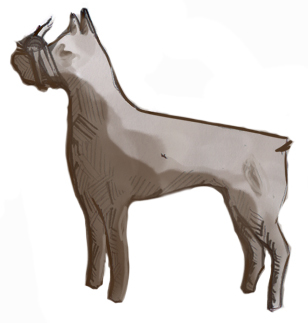 Anytime a character buys, creates or othervise procures a dog charm, there is a 20% chance that it is botched and works the other way around (making dogs extremely interested in the thief and substituting one point from the Stealth skill until the charges run out). Yeah, it is not dead. Not yet anyway, so enjoy it while it lasts. Hopefully, it will take some time before Stygian Archives fall dormant again (i.e. before I stop posting again). That said, if you have any ideas for maintaining blogger-motivation, please put them in the comments. I recently started game-mastering two games for two different groups (although both are based around the same bar) using – and that’s the important part – James Raggi’s awesome Lamentations of the Flame Princess (Grindhouse Edition). I do use my own house-rules (as most people do) and we don’t really play the weird fantasy game James describes in the referee book, but still, the LotFP rules, presentation and ideas are great inspiration for us. If you haven’t heard about this game, do google up a more wholesome review of it and check it out. It is worth the try. Of course, most of the content I generate now is based on the LotFP rules. Not that they are too different from odnd, except for the ascending AC and d6 based specialist skills (rolling skill or less on d6 to succeed). Just so you know. Ok, enough about me and my new obsessions, let’s do something interesting. Osborn the Ranger looked at the small pile of stones and scowled. “Really? This is going to help us find the spot again?” He scratched his short-cropped hair and looked around. The slope where their buried their findings was covered in stones and pebbles that were undistinguishable from the ones his friend just used to build the tiny pile at their feet. Vilas the Half-elf looked at him, picked up one of the stones from the pile and started walking away. Vilas dropped the stone. Against every expectation, the stone didn’t roll down the slope. Instead it kept bouncing towards the pile until it landed on it. This spell enchants a pile of rocks or similar small objects so, that any piece that is taken from it will bounce in its direction when dropped within 2 miles of the pile (as long as there are enough pieces left to constitute “a pile”). This spell is particulary useful when marking location of treasure hoard or just for keeping track of directions. This inconspicuous item is actually a very powerful magic and any mage who comes into posession of one of these can consider himself lucky. Linkstone can only be made by someone of great spiritual power who is connected to the mage for whom it is made by bond of gratitude, love or hate. As the name suggests, linkstone represents this link between the mage and the creator. In pinch, mage can use his linkstone to draw upon the power of its creator and recall a spell of 3rd or lesser level that he has already cast that day. This returns the spell into mage’s memory and turns the link unusable for (level of the spell) days. Also every time the linkstone is used in this fashion there is 10% chance it will be destroyed. Creation of a linkstone is no small thing, as it represents a strong and potentionally dangerous spiritual connection to the creator. Vilas entered the common room and pulled the black veil covering his face aside. Most of the patrons were local Naranese, pale and somber, so the ranger had no hard work spotting the man he was looking for. The tawny, golden-eyed Southerner stood out as much as Vilas himself did with his green eyes and red hair. He wore the same black clothes as everyone in the room, which made the inside of the alehouse look like a funeral feast. For all Vilas knew, it easily could be one. He approached the sand-rider trader, bowed and whispered, for the atmosphere of the place made everyone whisper. The golden-eyed man nodded, finished his drink and put a hectagonal stone coin on the table. They both put their veils over their faces and together they walked out of the door, into the Grim Alley. Lud-Naran is also called the Necropolis and the City of Tomb. The reason for this is apparent to anyone who enters it, after they have left their horses at the gate and put on the black robes and funeral veil as required by the tradition. A long time ago, the graves spilled from Naranese necropolis into the streets and turned the city into one huge graveyard. The main street is lined with gravestones and overgrown by moss. Every fourth entrance leads into a tomb. And citizens of the city meander through its alleys and avenues like dark shadows. It is considered bad luck to wear other color than black and everyone covers their faces in the streets so as not to anger the dead. The people of Lud-Naran are pale, dark-eyed and solemn. They are considered the best stone-masons in the world (even their coins are made of stone) and experts on burial rites. The city is ruled by a council of priests, one for every major deity of death or afterlife. Naranese reverence for (or fear of) the dead goes so far, that they even teach their children a strange artificial language they call Deadish, which their sages created with the decomposition of lungs and vocal chords in mind, cobbling its vocabulary together from all the dead languages they knew. In Lud-Naran the dead rule, it is said. And it may well be true, considering the stories of night disappearances of those who broke the traditions or stole from the graves. It is not unusual for a wealthy merchant or infuential noble to wish to be buried in the Necropolis in hope of living some secret life after death. By now, it must be apparent from my writing that I’m not a native English speaker. A missing article here, a strange phrasing there and it becomes rather obvious. I come from Czech Republic where I’ve lived most of my life. I learned some English from the shaman of our tribe and then practiced it with salt-traders who came to the cave complex every month or so to trade salt and steel for deepfish, gems and ore. But seriously. I come from a bit different (gaming) culture. In Czech Republic, we had our retro-clones even before DnD was retro. 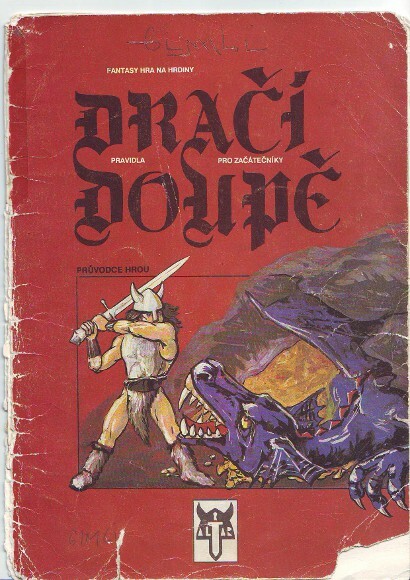 Czech mutation of DnD called DrD (Dračí doupě) first came out in 1990 and was so heavily inspired by the original that it even had the same layout as the BECMI basic set. But Dungeons and Dragons itself, the fabled original, was all but unavailable in Czech Republic at the time. It had about it a mythical air of perfection from beyond the sea, especially when the magical word Advanced was added to its name. Of course, that was in the years after the revolution before we caugh up with the rest of the world and discovered global culture and the internet. I still remember how I got my ADnD books from a small shop in the capital city in 1997 and started playing with my classmates. It was my first English roleplaying game and, although I sporadically played Dračí Doupě before, it was also the first RPG I played regulary. Only then I started to explore the Czech gaming community. This is what Bohemian Gaming is going to be about. It will be series of articles about how it went in Czech Republic, as I experienced it. With this spell the Magic User locks eyes with one intelligent target and makes him stop in his tracks. Unless the target makes a saving throw (at penalty equal to Magic User’s Charisma modifier), he is paralyzed, dumbly staring into Magic User’s eyes. This spell can be mantained for as long as the eye-contact is mantained and Magic User concentrates on it (which means he cannot cast spells, defend etc.) but no longer than 1 turn. Also, any harm done to the entranced target will break the spell. This spell will not affect target with more than 4 HD.